Raj Jain has a distinguished career as an executive at some of India’s largest consumer goods and retail companies, and he will now add media to that mix of industry experience. Jain was recently appointed CEO of the Times Group media conglomerate that among other properties, publishes The Economic Times and The Times of India—the largest English publication in the world. 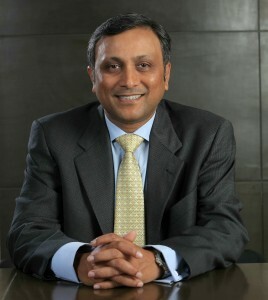 He is currently the CEO of Bharti Retail, a multi-brand venture that includes Easyday stores, and has previously headed Walmart India, served as managing director and CEO of Whirlpool India, and worked for Hindustan Unilever. Jain has spoken to Fuqua’s Global Executive MBA students studying in in Delhi. He shared insights on the retail industry, leadership, and the evolving Indian consumer market in a Fuqua Q&A. Q) You have lived and worked in China and have previously said there are more differences than similarities in how one would operate a business there verus India. Could you provide an example? Additionally, how would someone build the necessary skills for working cross-culturally between these two countries? I often say that the only similarity between India and China is the one billion-plus population! While this may be an exaggeration, truth is that the two emerging countries are very dissimilar. Starting with the customer, one should remember that China has pursued a one child policy over 25 years. This has had a significant bearing on family structure, the role of women in society, and aspirations of young families. Coupled with rapid urbanization, Chinese cities and urban customers have developed very differently from those in India. For example, a large majority of women are part of the workforce in urban China while this number is in the teens in India. Women at work have a significant impact on, say penetration of washing machines, home aids and many other time/effort saving devices at home. Similarly there is a significant adoption of western wear (for the office) among women in China versus ladies traditional apparel sold and tailored in India. On another note, for various cultural, language and historical reasons most young Chinese prefer working for local companies rather than for western multinationals. This is almost the reverse in India. Understanding some of these basic factors in a society is critical to effectively working cross culturally, much more than language and other visible cultural symbols. Q) What principles of supply chain optimization that have worked in other industries and/or parts of the world have been the most successful when applied to the growing consumer goods and retail industries in India? India supply chain is very different from western and emerging countries; it is driven by state-level taxation, poor road infrastructure, small body trucks and lack of palletization in the movement of goods. Additionally, by law it is required to declare a “maximum retail price” on all package goods which adds tremendous complexity and constraints in supply chain management. Despite these issues, good practices for small and medium size vendor development, quality assurance, shelf-ready packaging and integrated IT solutions are some examples of practices which have been adopted and effectively used in India from other parts of the world. Q) Compared to the demographics of other large economies, India has relatively young working population and middle class. How does retail adapt its model to fit their consumer preferences? India is a very young country with a median age of approximately 26 years. By some estimates the country is getting younger and will continue to do so for some years. A large part of India’s young middle class lives in a city and small houses with their parents. Additionally, due to a low percentage of working women there is great emphasis on fresh and scratch cooking in Indian homes. Retailers have to ensure that they have great produce and dairy offerings for their customers that can compete on price and quality with local wet markets. Since urban housing is small in size most customers would not buy large pack sizes or stock up groceries for long periods of time. There is also a huge preference for loose grains and staples which is unique to countries like India and China. Appropriate range and display of loose grains is critical to selling groceries in India. Q) Your background is in engineering. Can you describe a key skill from early in your career that helped propel you into the general management and executive leadership roles you’ve occupied more recently? I started with my career as an engineer on the shop floor in factories and then moved to the sales and marketing side of the business. Key skills which helped me transition from technical roles to marketing roles were customer observation and focus (internal & external). Being an engineer taught me to be process-driven, a skill which I later used in all aspects of marketing and general management. Lastly building engaged teams whether on the shop floor or in the market place is a key skill I learned and built over a period of time. Q) What are the key qualities to being an effective leader? I believe effective leaders in today’s day and age are those who can build high-performing teams. Their ability to co-create a vision with their teams and relentlessly execute is critical to being successful in a fast-changing consumer environment. Strategies have to undergo constant change. Change by nature causes uncertainty and ambiguity, and an effective leader needs to hand-hold the team while negotiating such change. On another note, when faced with a moral dilemma, walking away from short term gains is a tough choice. Always remember that there is no right way to do a wrong thing! Finally every good business needs to serve humanity for its betterment. A leader’s role is to see the link and communicate it effectively throughout the organization. People need to feel that their daily work is making a positive change to the betterment of humanity.